Kingdom of God Media: Who Killed the Electric Car? Superbad ... why not Super-good? Equilibrium -- What is Good? Equilibrium -- Are We Americans Safe? Who Killed the Electric Car? documents GM's fleeting attempt to produce an electric car (the EV1). The film is poignant and yet all around fair. It puts forth a candid history of the electric car without any detectable malice or lopsided agenda. So who killed the electric car? Here are the possibilities. -- The Federal Government. The state of California builds a few years of momentum for the wide-spread use of electric vehicles until the federal government steps in to curtail this effort. -- Big Oil Companies. They buy out federal legislators who will keep fossil fuel in business. They also buy out any up-and-coming technology that might threaten their archaic combustible energy. -- Car Manufacturers. Electric cars require less maintenance, which poses a significant financial loss to car companies. Gas-powered cars contain dozens of parts that are designed to wear out before long, which keeps customer's paying for the car long after they purchased it the first time. So what does this have to do with Spirituality, or God? There is one overarching issue driving the conflict between oil and electric power: Sin. The dishonesty, greed and extravagant thievery of big oil companies is oppressing the whole world, both humanity as well as the environment we need to keep living in. Who Killed the Electric Car? communicates this in an admirably civil and understandable manner. One of the main strengths of America is the conviction that people need to be free. This stems from the fact that God designed people to live free, not as robots or slaves. God endows everyone with the priceless gift of free will -- the opportunity to choose. Americans have been successful because the U.S. government is designed to keep out of the way. However, the U.S. government is designed to intercede if the people's freedom are ever at risk. Big Oil continues to stifle the American people's freedom. The most obvious explanation for this is: Big Oil has infiltrated American legislation. The mentality of Big Oil demonstrates the shortsightedness and general stupidity of sin. By their unfair business practices the CEOs of oil companies are destroying the economic framework that made them rich in the first place. Who will pay for their overpriced gasoline after everyone is stripped bare from overpriced gasoline? A hundred million dollars won't quench their love for worldly junk... they need hundreds of millions of dollars. In this way, lovers of this world might accumulate more than everyone else, but what good is all the junk in the world if it costs them their soul? Tags: Who Killed the Electric Car? 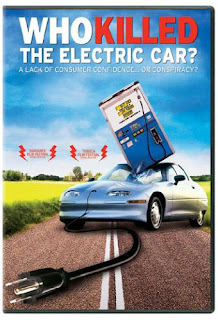 This movie propogates a myth that "alternative vehicles" are the solution to the massive environmental disaster created by automobiles. Equity and sustainability must be promoted by eliminating sprawl subsidization and building compact development around transit for the urban poor. I work for a big oil company. You wish you were me.